Superware branded trays . 100% pure melamine. FDA certified. Made In thailand. - Square Melamine Tray is an excellent choice for restaurants, buffets, caterers and any food service for an elegant yet durable presentation. - Featuring an attractive, contemporary shape, is ideal for serving a variety of foods including entrees, appetizers and desserts. - Easy to care for and shatter-resistant and dishwasher safe. 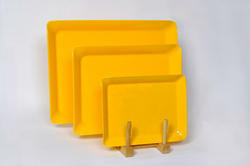 We are mfg and supply plastic food trays various size..
- We have all the sizes available with us. - We provide best quality Plain White Melamine Dinner Plates which is mostly used by caterers. - We only deal in quality melamine plates with genuine material. 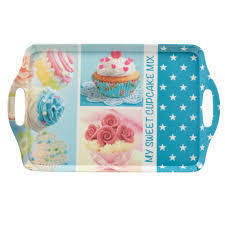 Also providing Design Melamine Tray. We are occupied in the manufacturing of Tray Sets. These products are constructed by our professional using most modern techniques and utmost raw material. To maintain the quality, we source this raw material from the reputed dealer of the market. We are capable to design these products as requested by our valued customers. Kitchen Tray is designed in a unique manner to be used at homes to serve. It is versatile enough for everyday use. - Available in sizes 22" x 10"